Ibtisam Musa, a proud Palestinian woman, who against all odds, decided to face the challenges life threw at her and not to give up till she achieves her dreams. Ibtisam was living a simple yet beautiful life, working with her husband to provide for her family of eight and earn enough to pay for her childrens’ education. She has always been a true entrepreneur. She didn’t accept the reality and made her mind to change it. She started by investing in some cattle, then moved to some micro projects around preparing food for the local market. One day, an opportunity presented itself, and Ibtisam was there to seize it. 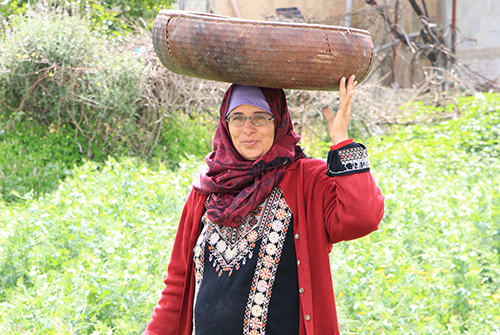 Canaan was looking for women cooperatives to produce high-quality Maftoul, and Ibtisam with her experience was a perfect fit. She coordinated with other like-minded women from her village and started what would become one of the most successful women cooperatives in Northern Palestine. This is the cooperative that has been one of the main sources for the best Maftoul Canaan is offering in international markets. Ibtisam is now part of a strong cooperative, she and her partner women are leading the daily operations and have become the talk of the town. She believes that she accomplished one small dream, and is ready for the next step towards placing Palestinian women on the map as the strong, independent, creative, proud individuals they are.